A few weeks ago Tim and I attended a highly inspiring talk by Alex Steffen at Town Hall. The entire evening was magical: introduction by mayor-elect Mike McGinn in his first post-election appearance, the inspiring and motivating talk by Alex, yummy beer in eco keg cups from Fremont Brewing, followed by hop-lubricated conversation with like-minded Seattleites interested in changing the city. Plus all of this bookended with rides to and from downtown with my favorite cycling buddy. 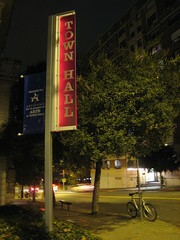 We left Town Hall filled with hope for positive changes in Seattle. We all have a lot of work ahead of us if we want to grow Seattle into a dense sustainable city designed with people in mind. Encourage nightlife. (see young people are key) Part of making a city livable is to make it livable at all hours. When people are out appreciating art, supporting live music, and yes even drinking at bars, they are sending a message that the city is a safe, exciting, fun place to live. Portland lives these last two points. Mayor Sam Adams has said he welcomes youth because he knows that they are future resource for the city. Many of these young people may even be unemployed, but according to Mayor Sam, that’s OK. They can participate in arts, civics causes, and share their youthful enthusiasm. And then when the economy does grow they provide a built-in a pool of talented workers, committed to the community, and ready to help take the city to the next level. We can go even further here. Steffen has a grand goal for Seattle to be carbon neutral by 2030. To make this admittedly lofty target a reality, everyone must decide to actively bring about change in our community. We at Car Free Days are thrilled say on record that we are dedicated to being part of the solution, and part of Seattle’s brilliant future! We’re doing our best to bring about change one bike ride and one conversation at a time. How about you? 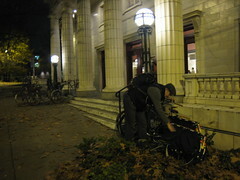 This entry was posted in bigger than here, bikes, Human Powered Politics, neighborhoods, sustainability and tagged Alex Steffen, beer, change, density, sustainability, Town Hall Seattle, urbanism, Worldchanging. Bookmark the permalink. Hey Julian – it was good getting to ride to the Metal Cowboy event. I got a couple photos of that fancy spoke light of yours, too.Must post them soon! Here’s a link to the talk Alex Steffen did the previous night…similar message.